If you’re looking to upgrade your new computer with an Ivy Bridge processor, then you’ll need to upgrade to one of Intel’s newest chipsets; Z77, Z75, or H77. While there is one exception to this, the Gen3 Z68 models, you’re still better off going with one of the newer chipsets in order to take advantage of Native USB 3.0 integration, memory improvements, and better power consumption and delivery. When I get questions about what kind of motherboard someone should purchase I generally take their needs and experience into question. Those who don’t overclocking should basically just look for a good brand that will be stable and last a long time. Then there are really two other groups of overclockers; those who have to have the best, and those who are satisfied with paying a little bit more to get very close to the best. I’ll try to incorporate various options into this post for all types of buyers. If you do have to have the best of the best, then I recommend you go with the ASUS Maximus V FORMULA Z77 chipset motherboard. I certainly wouldn’t recommend this for the common consumer, but if you have the cash and want to mess around with the best, then this is it. At around $300 it’s actually very reasonable when compared to other ROG models. You can get enough performance out of the Gigabyte GA-Z77X-UD5H to still satisfy most extreme overclockers. Features include the Gigabyte All Digital Power Engine, Gigabyte 3D Bios, Gigabyte 333 Onboard Acceleration, Lucid Universal MVP Support, and more. Key Details for this motherboard include; up to 32 GB DDR3 Dual channel memory, PCI Express 3.0 x16 (x16, x8, x4), 4 x SATA 3Gb/s, 5 x SATA 6Gb/s, 6 x USB 3.0 + 4 x USB 2.0 ONBOARD USB, a 3 year parts and labor warranty, and rear panel ports include; D-Sub + DVI, HDMI, 1 x DisplayPort, 2 x USB 2.0, 4 x USB 3.0, 1 x IEEE 1394a, 1 x eSATA 6Gb/s, 1 x Optical, and 6 audio ports. 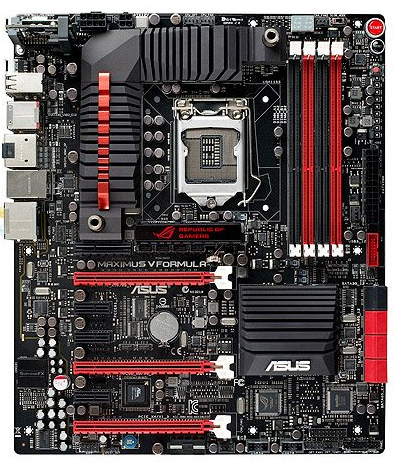 If you’re looking for a good motherboard under $150 I recommend you go with either the Asus P8Z77-V LX or the Gigabyte GA-Z77X-UD3H for the best bang for your buck. Both of these are moderately easy to overclock, stable, and good enough for the majority of gamers. What motherboard would you pick at each price range? Let me know by leaving a comment below.